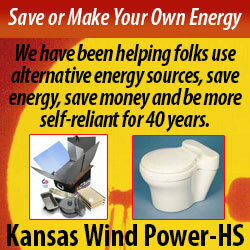 Kansas Wind Power – Alternative Energy Since 1975 13569 214th Road, Holton, KS 66436-8138 785-364-4407 www.kansaswindpower.net Save Money & Energy – We are a pioneer in the alternative energy fields, having been in business since 1975! We know alternative forms of energy and can help you enrich your life by adding them to your household. Kansas Wind Power assisted with the installation of the first wind turbine connected to a Kansas utility company near Lawrence, KS, in 1976. Be self-reliant and energy wise — Make your own home electricity with alternative energy Wind Generators and Solar Electric Modules (also called Photovoltaic or PV). The PV modules generate electricity when exposed to light, have extremely long life, no moving parts and almost no maintenance. Installing a home energy system is within the grasp of many people. You can start small and add on as needed. Many homes in the USA and world wide are already using wind and solar electricity. They are statements to reducing pollution, waste, dependence on fossil fuels and increasing independence and self-reliance. Make your home, cabin, farm, camper or RV better and be more self-reliant. There is always a risk of natural disasters and conflicts. Be prepared with sources of electricity, water, food, fuel, etc. A disruption in commerce, no matter the cause, will catch many people dependent on others to bail them out. Become more prepared so you will be in a position to help others and not be a burden to your community. A home alternate energy system from Kansas Wind Power might include: 1000 watt wind turbine generator on tilt-up tower eight 140 watt PV modules on a tracker mount Power boosting Charge controller (MPPT) TriMetric Battery Monitor Meter (battery “fuel gauge”) Deep cycle batteries with battery Desulfator Inverter to convert battery power into AC electricity DC circuit breakers DC loads such as water pump, lights, fans, refrigerator (or propane refrigerator) This system could provide 3.7 kilowatt hours per day from wind in a 10 mph average wind area. Solar could provide another 2-6 KWH/day depending on climate. A small system of 1 or 2 PV Modules is commonly used for RVs, campers, water pumping or as a starter system. An engine powered generator can be used as a backup to power large loads and to help charge battery during low wind and solar periods. Solar or Wood fired water heaters are a great way to provide hot water and not burden your energy system. The TriMetric Battery Monitor is a good meter to monitor the battery bank status for home, cabin, RV, boats and electric vehicles. Small systems can be 12 volts. Medium or large systems are 24 or 48 volt. We encourage people to be more energy efficient so their system can be smaller, cost less and reduce their cost of living from now on. Contact us today and tell us your energy needs; we’ll be glad to help you purchase the right system!